The story of Indian art and sculpture dates back to the Indus valley civilization of the 2nd and 3rd millennium BC. Tiny terra-cotta seals discovered from the valley reveal carvings of peepal leaves, deities and animals. These elemental shapes of stones or seals were enshrined and worshipped by the people of the civilisation. 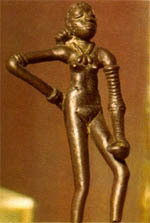 Two other objects that were excavated from the ruins of the Indus valley indicate the level of achievement that Indian art had attained in those days. The bust of a priest in limestone and a bronze dancing girl show tremendous sophistication and artistry.